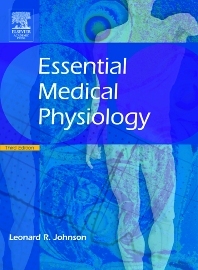 Essential Medical Physiology, Third Edition, deals with the principal subjects covered in a modern medical school physiology course. This thoroughly revised version includes chapters on general physiology as well as cardiovascular, respiratory, renal, gastrointestinal, endocrine, central nervous system, and integrative physiology. It contains clinical notes, chapter outlines with page numbers, 2-color figures throughout, and new chapters on Exercise, Diabetic Ketoacidosis, and Maternal Adaptations in Pregnancy. Among the contributors to this indispensible textbook are leading physiologists Leonard R. Johnson, Stanley G. Schultz, H. Maurice Goodman, John H. Byrne, Norman W. Weisbrodt, James M. Downey, D. Neil Granger, Frank L. Powell, Jr., James A. Schafer, and Dianna A. Johnson. This text is recommended for medical, graduate, and advanced undergraduate students studying physiology, physicians, and clinical specialists as well as anyone interested in basic human physiology. Medical, graduate and advanced undergraduate students studying physiology, physicians and clinical specialists, as well as anyone interested in basic human physiology.